Each items' "Rick tested" features work to make every trip smoother and more enjoyable. 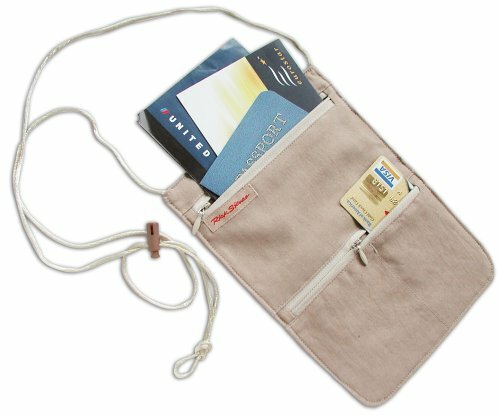 Silk Comfort: Made from comfortable spun silk, our sturdy, ultra-light Neck Wallet provides a pickpocket security for those who'd rather not wear a money belt. For Every Body: Its smooth neck cord is adjustable, so you can wear it over your chest, tummy or shoulder-holster-style. Secure Storage: The main zippered compartment features a moisture-barrier liner, perfect for you airline ticket, railpass or passport. A second zipper reveals two "easy access" compartments - one for your cash, and one for your debit/credit cards. It worked really well. The internal plastic liner was a pice of junk.